Eye allergies or ocular allergies are quite common, but can be quite irritating and annoying. The allergic reaction can be mild or severe, and it may appear suddenly, occur in a particular seasonor occur anytime irrespective of season. There may be another underlying factor causing seasonal allergies – it could be fungi or pollen found abundantly in a particular season. Perennial allergy that can appear in any season suggests you're allergic to an allergen (insects, dust mites, etc.) present in your house. It is a good idea to consult with an eye specialist as some allergy cases can be serious and damage cornea of the eye. The simplest remedy is to use allergy eye drops which can help deal with eye allergy symptoms such as burning/itchy eyes, irritation in the eye, bloodshot eyes, tearing, and swelling of the eyelid. Over-the-counter eye drops may work sometimes, but it is better to consult with a specialist before pouring anything into your eyes. Different types of allergy eye drops are now available to treat your condition. You can opt for vasoconstrictors, lubricants, mast cell stabilizers, antihistamines, NSAIDs and corticosteroids. You have to consider the severity and underlying cause of your allergic reaction to select the right type of allergy eye drops. Here's a bit more about some of the most commonly used allergy eye drops. These drops are available in two different categories – corticosteroids and non-steroidal anti-inflammatory drugs (NSAIDs). For severe itching, you can opt for NSAID eye drops because they affect your nerve endings and eliminate itching in about an hour. However, you may experience some burning or stinging sensation when you first use NSAIDs in the eyes. Corticosteroid eye drops are usually effective for the treatment of long-term, severe allergy symptoms. Lotemax and Alrex are the most common prescription steroid eye drops, but they can have side effects and raise your risk for eye infection, cataracts, glaucoma, and elevated pressure in the eye. So, avoid its long-term use and keep in touch with your eye specialist throughout the treatment. They are still new in the industry, but are quite effective in targeting what causes red eyes, itching and other symptoms. It works by restricting the release of histamine produced by your body during an allergic reaction. These eye drops usually don't provide immediate relief, but they present a treatment option to prevent eye allergy symptoms from showing up in the first place. It is a useful treatment choice for people with seasonal allergic conjunctivitis. You can use these drops for months without side effects. Some of the most common OTC mast cell stabilizer drops are Refresh Eye Itch Relief and Claritin Eye, whereas prescription eye drops include Alocril, alamast, Crolom and Alomide. These drops usually contain multiple active ingredients and are effective for watery eyes, eye itching and redness. They may have decongestant and antihistamine properties combined in one product – the list include Opcon-A and Naphcon-A and Vascocon-A. You can also find antihistamine and mast cell stabilizer combination drops, such as Patanol, Elestat and Zaditor. These types of eye drops are especially beneficial for tearing, redness, burning and itching in the eyes. It also works effectively for allergic conjunctivitis patients. These allergy eye drops work by shrinking swollen nasal passages and reducing the size of blood vessels in your eyes to treat bloodshot eyes. Common decongestants are pseudoephedrine and phenylephrine. Some combination drugs are now available in the market that offer mixed benefits of antihistamines and decongestants. In any allergic reaction, your body releases a substance called histamine that dilates blood vessels and even makes the walls of those vessels permeable. This produces certain symptoms such as watery eyes and runny nose. Antihistamine eye drops reduce allergic reaction by stopping histamine to attach to the cells in your body that produces an allergic response. Whether you're using multiple-action allergy eye drops or other anti-inflammatory allergy eye drops, you need to know how to use them properly. Wash your hands properly before applying eye drops. To avoid contamination, never touch the dropper tip. Make sure you're not wearing contact lenses when applying the eye drops, and insert your contact lenses back at least after ten minutes of using your medication. Inspect the product carefully before you use it in the eyes. Never use it if the liquid is discolored or cloudy. Discard it carefully. Use your eye drops no more than 4 times a day, or as directed by your eye specialist. Don't overuse allergy eye drops,as it may worsen eye redness. Contact your doctor immediately if it occurs. Don't use specific eye drops longer than 4 days at a time. 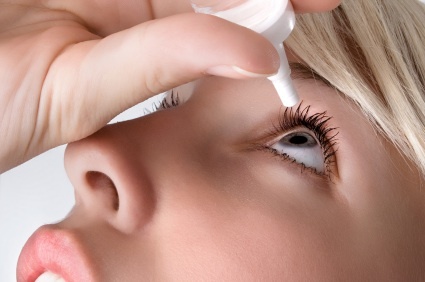 Discontinue the use of eye drops if your condition doesn't improve in 72 hours. This usually happens in case of a serious medical problem, so seek immediate medical attention to find the real cause of trouble. Relax yourself and tilt your head back a bit. Pull down the lower eyelid of your affected eye with your finger while looking upward. This will create a small pouch. Now, hold the dropper over the eye and squeeze it lightly to place a drop into the pouch. Close your eye for a couple of minutes. You may also want to apply gentle pressure at the corner of your eye to stop the liquid from draining out of your eye. Never rub the eye though. Place the dropper cap back tightly after each use. Only apply another medication at least after 5 minutes of using your eye drops. If you're also using eye ointments with drops, be sure to apply the eye drops prior to the ointment as it will ensure the drops enter the eye completely.